On April 26, 1986, a disastrous accident at the power station in Chernobyl, Ukraine led to the release of more radiation into the atmosphere than the nuclear bomb released over Hiroshima, Japan in the Second World War. A routine test gone wrong resulted in what has been called the worst power plant accident in history – comparable only to the more recent disaster at the Fukushima Daiichi power plant in Japan. For almost two weeks after the disaster, the ruptured Chernobyl reactor continued to spew radioactive substances into the air, including iodine-131, cesium-137, plutonium and strontium-90. Russia, Ukraine and Belarus were directly affected, and reports indicate that radiation was subsequently detected in every European country except those on the Iberian Peninsula. In fact, over 200,000 square kilometers of land in Europe was affected by the radiation. Now, even after three decades of clean-up attempts, a boar shot in Sweden has been found to contain 10 times the normal level of radiation. The U.K.’s Daily Mail is reporting that the wild boar was shot in Augustin the Gävle in the center-east of Sweden and then examined by environmental consultants who check radiation levels in game meat. The boar’s radiation level of 13,000 becquerel per kilogram (Bq/kg) was nearly 10 times the 1,500 Bq/kg established as safe for human consumption by Sweden’s Food Agency. “This is the highest level we’ve measured,” Ulf Frykman, one of the environmental consultants, told Sveriges Television (SVT), as reported by the Mail. He added that only 17 percent of all the samples he tested in the past year have been at or below the agency’s “safe” limit. Radiation levels in wild boar continue to escalate in Sweden, even though levels in elk and reindeer have been dropping steadily for years. Experts believe that this is because the boar migrate further north to the areas most affected by the disaster. Though the radiation doesn’t seem to harm the animals themselves in any way, eating their meat poses an increased risk of cancer for humans. Initial attempts to extinguish the burning reactor involved fire fighters pouring cooling water into the reactor, and were abandoned after 10 hours. From 27 April to 5 May, more than 30 military helicopters flew over the burning reactor. They dropped 2400 tonnes of lead and 1800 tonnes of sand to try to smother the fire and absorb the radiation. These efforts were also unsuccessful. In fact they made the situation worse: heat accumulated beneath the dumped materials. The temperature in the reactor rose again, along with the quantity of radiation emerging from it. In the final phase of fire fighting, the core of the reactor was cooled with nitrogen. Not until 6 May were the fire and the radioactive emissions under control. 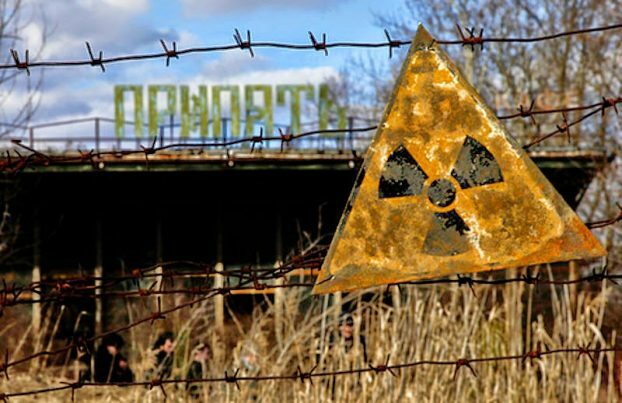 As bad as radiation levels are in surrounding countries, experts estimate that the immediate area around Chernobyl will be uninhabitable for 20,000 years. And rather than learning their lesson and looking to alternative, safer sources of energy, governments continue relying on nuclear power for 5.7 percent of the world’s energy and 13 percent of its electricity. With 437 nuclear power plants across the globe, the next disaster could be just around the corner.